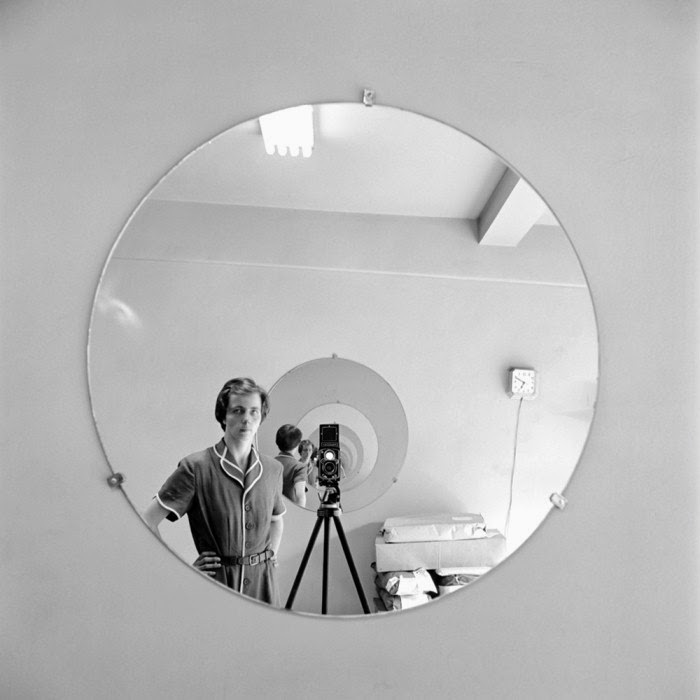 Vivian Maier was a much better photographer than she was a nanny, but nobody knew during her relatively anonymous life. Were it not for a fateful box of negative bought on-spec at a clearance auction, Maier and her work would have quietly slipped into oblivion. 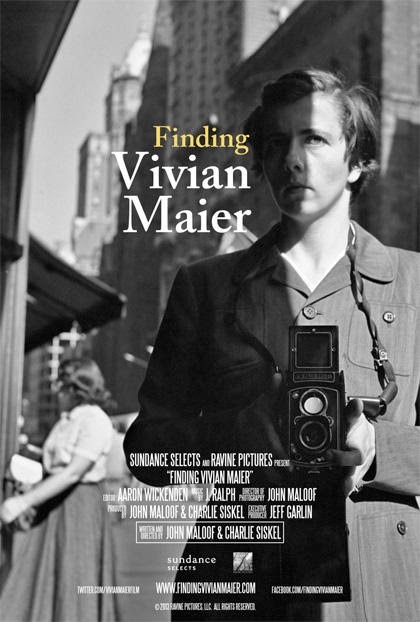 John Maloof, the scrounger who “discovered” Maier & co-producer-co-director Charlie Siskel uncover the unheralded street photographer’s life and art in Finding Vivian Maier (trailer here), which opens this Friday at the IFC Center. Given her resemblance to RKO contract player Edna May Oliver, it was probably preordained that Maier would be a nanny. Maier’s former charges all remember her carrying a camera on their outings, as well as her forceful personality, but none of the families she worked for (briefly including single father Phil Donahue) ever thought they really knew her. They certainly had no idea of the extensive photographic archive she amassed. Ironically, Maier’s photos did not really fit the project Maloof was working on, but he recognized they had “something.” He put a few on the net and they quickly went viral. Suddenly administering the Maier collection became his calling. Somewhat to his surprise, the proper photographic art establishment has been reluctant to embrace Maier (although sage viewers might not be slack-jaw shocked to find them jealously guarding their cultural gate-keeping roles). 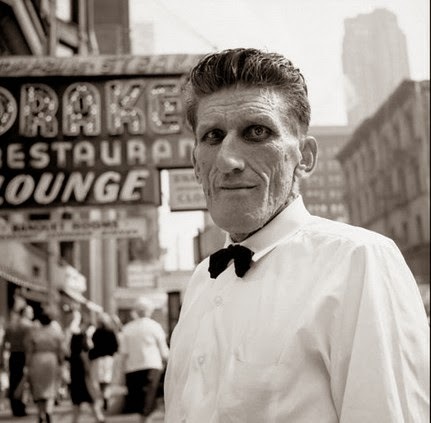 However, some of the most striking sequences of Finding compare Maier’s work side-by-side with thematically related pictures from canonical photographers, including Diane Arbus. Needless to say, her work holds up. Indeed, a blind viewing of her photographs might lead one to guess they were the work of an artistic affiliated with the Photo League in its heyday. Finding effectively showcases Maier’s oeuvre, but it is not hagiography. Far from being St. Vivian the Undiscovered, Maier’s behavior evidently took a problematic turn in her later years. To their credit, Maloof & Siskel never shy away from troubling incidents detailed by the grown children once entrusted to her care. After all, artists often exhibit anti-social tendencies. Considering her interest in macabre subjects (even shooting crime scenes when the opportunity arose), an armchair Freudian would readily assume she had a host of unresolved issues. Remarkably measured, Finding does its best to present a full portrait of the elusive Maier. It is marked by a deep sense of mystery, but Maloof also vividly captures the exhilaration of discovering her rich body of work. It is considerably more of a film-viewing experience than the majority of art docs, which mostly just invite the audience to marvel at how nice such-and-such pieces might be. Instead, Finding is a tad edgy, but still oddly uplifting. Highly recommended for photography connoisseurs and anyone who appreciates documentaries executed with a bit of style, Finding Vivian Maier opens this Friday (3/28) in New York at the IFC Center and Lincoln Plaza Cinemas.